Ghost ants are extremely small and hard to see. Their head and thorax is dark brown, their abdomen and legs are translucent. Ghost ants are 1.3-1.5 mm in length however, the translucent parts of a ghost ants body make it seem around 1 mm smaller. The translucent aspect of the ghost ant is what gives this insect its name. The ghost ant is a common pest found throughout Florida. 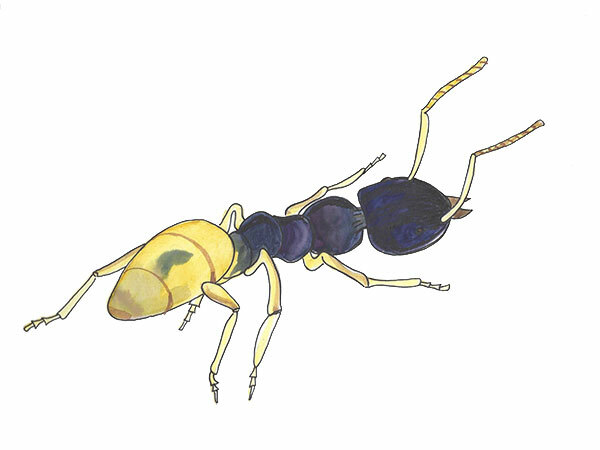 The principal habitat for the ghost ant is outdoors, however they are known to venture inside homes and can easily establish colonies once inside. Ghost ant colonies living outside are usually located in soil, dead grass or vegetation. Once inside, ghost ant colonies can live between cabinets, subfloors and other hard to access areas. Ghost ants are often found trailing from outside a structure to inside. They can gain access through just about any opening including cracks in a foundation, roof eaves or the chimney. Ghost ant colonies can be quite large with thousands of workers and multiple. The size of ghost ant colonies ranges from small to large and can include numerous females. New colonies begin through a practice called budding. Budding is the process where one or more females separate from the colony with a handful of workers and perhaps some larva. The separating group searches for a suitable nesting site and soon creates a new colony. The primary diet of a ghost ant consists of honeydew collected from aphids and a wide variety of insects. When ghost ants are infesting a home or business they prefer to eat anything sweet, however they will eat protein-based foods if nothing else is available. In Florida, ghost ants have invaded greenhouses, restaurants, and homes. Any type of food will attract ghost ants, especially sweets. Keep food stored in tight containers and make sure to clean well after using sugar-based products. Remove plants that will attract ants or aphids. Keep the outside perimeter of your home or business manicured and pull mulch or shrubs off the structure. For ant control, follow the trail back to the nest and treat the nest. If baiting, try placing the bait on the ant trail and switch the bait until its successful. Warning: Pesticide is poisonous and should be handled by a pest control professional. Always read the label and follow instructions before use. Cloud Termite and Pest Control has been helping customers get rid of ants since 1934. Please call us for a free quote on indoor ant control. We are available to service Bradenton ant control, Lakewood Ranch ant control, Ellenton ant control and surrounding areas.